What Is Puberty and How Does It Start? The word puberty is derived from the Latin word “puber” which means adult. Puberty is the term used to describe the years during which a girl’s body undergoes the transition to physiologic adulthood. A series of changes happen in the body. These changes cause sexual development, a different body shape and an increase in height. Also, this is the time when a girl begins to mature emotionally. Not only does her body change how it looks but it also changes how it works. During puberty is when a girl starts her menstruation. Puberty starts when a part of a girl’s brain called the hypothalamus starts to produce a hormone called GnRH (gonadotropin-releasing hormone). Once the hypothalamus starts to release this hormone in a specific pattern called a “pulsatile pattern” it causes another structure at the base of the brain called the anterior pituitary gland to produce two important substances called FSH (follicle stimulating hormone) and LH (luteinizing hormone). These substances called gonadotropins then stimulate the ovaries to release estrogen and progesterone. The process of puberty has different stages. In girls, these changes usually start between the ages of eight and fourteen. The stages of puberty describe the changes that are happening to a girl’s body. Thelarche - During this stage, a girl’s breasts begin to form. This starts with a small change called a breast bud. Breasts begin to form around age 11 although recent studies show that this process is now starting earlier. Girls may begin breast development around age 9. Sometimes only one breast will start to develop. Usually within a few months, the other will start as well. This can be perfectly normal. Pubarche - This is the initial appearance of pubic hair that is very fine. This usually happens around the same time as breast budding but may happen a little later. Adrenarche - During this phase, pubic hair increases in amount and changes in texture from fine to coarse. This is also the time when underarm hair develops and body odor starts. During this phase is also when girls start to develop acne and attitudes. This phase happens in the years between the first breast bud and the first period. Menarche - This is the term used to describe the arrival of a girl’s first period. The average age is 12 years old but a little earlier or a little later can be perfectly normal. During puberty is also when a girl starts to get taller. So right after the appearance of breast buds a girl’s height will begin to increase at a quicker pace than when she was younger. 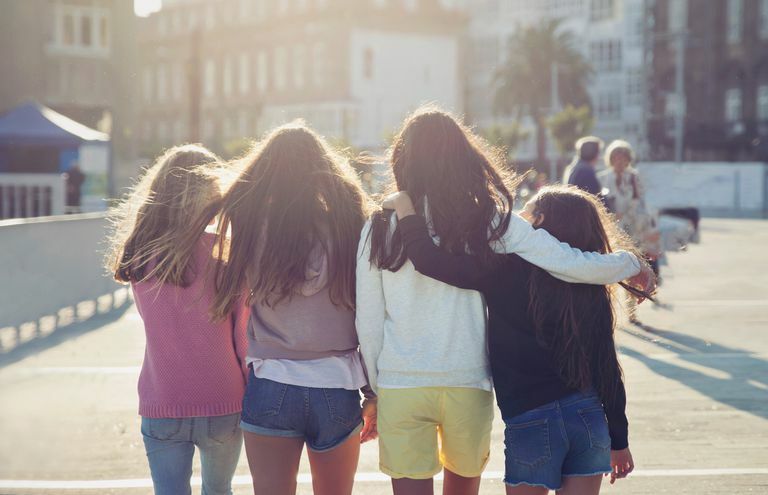 At some point during puberty, a girl will have a very rapid increase in her height, this is usually a called a “growth spurt.” This typically happens just several months before a girl’s period starts. When a girl starts these changes and how long the process takes varies from girl to girl. On average from the appearance of breast buds until the first period takes about 2 ½ to 3 years. But it is perfectly normal if it takes a little less time or a little more time to complete these changes. If breast buds or fine pubic hair begin to develop before age 8. If there is no breast development by the age of 14. If menstruation has not started in a girl by the age of 16 who has had normal breast and pubic hair development.